Just about everyone has a friend or family member whose kitchen is always immaculate. No matter what time of the day or night you might pop in and try to catch them with dirty dishes in the sink, or splashes of pasta sauce on the stove top – the kitchen is always clean. While it’s possible they might have their very own Dobby the House-Elf, it’s highly unlikely. It’s more likely that they simply have a smart cleaning strategy. 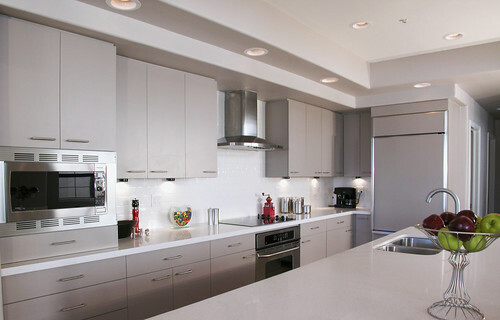 Here’s a list of tips that will help you achieve and maintain the always clean kitchen. Plan to perform additional small tasks each day. At night when you’re cleaning up after dinner is a perfect time to go ahead and clean out the fridge and freezer and wipe it down, or clean the stove, or other tasks that you would normally perform on a dedicated cleaning day. Adopting this habit as part of you daily routine will help to ensure that your kitchen is always in good shape. Take full advantage of your dishwasher. It seems as if just about everything is dishwasher safe these days so why not take advantage of it? You can take the non-electric parts of your electric can opener and wash them in the top rack of the dishwasher. The same goes for stove parts such as drip pans and burner covers. Small drawers and shelves from the refrigerator are easily cleaned and disinfected in the dishwasher as well. Many experts now believe that dishwashers actually use less water than hand washing so it’s an added bonus that you’ll be conserving resources and saving on your water bill. Always try to run the dishwasher only when you have a full load. See things from a new perspective. Stand on a step stool or chair and see if there are any spots you might have missed or that need special attention such at the tops of cabinets. Always work from top to bottom. It makes sense to start at the top and work your way down as you’ll be directing any crumbs and dirt to the floor where you’ll eventually sweep them up and remove them from the premises. Keep them covered. Use attractive paper to cover the shelves in the kitchen cabinets. Select the type with a finish that will allow for easy wipe downs, and when it’s seen better days, simply toss it and replace. Be creative. When you encounter a cleaning task that no bespoke tool seems to exist for – use your imagination to find things around your house that will serve the purpose. Of course using a toothbrush to clean in small crevices is no new trick, but think things like the tip of a chopstick wrapped with a small bit of paper towel to gather crumbs from tiny spaces. Get some fresh air. If you’re working in a small space when cleaning your kitchen take big, bulky items outside to wash them. Things such as refrigerator shelves and over racks are prime candidates for this trick. If weather doesn’t permit then try taking them into the bathroom and washing them up in the bathtub. You’ll have more room which will allow you to get them cleaner, and you’ll be less likely to make a mess of the floor with splashing water. Tackle spills immediately It’s so much easier to wipe things up when they’re still wet than to scrub at them when they’re dry, and many substances such as red wine and pasta sauce can leave stains, while even a small puddle of milk or juice can turn the entire floor into a sticky mess if not handled right away. Try these hints and tips in your kitchen and no one will able to catch you with a less than spotless space. Heather Baldwin provides advice on how to more easily maintain your home on behalf of AdvanceMe America’s leading merchant cash advance provider.